When your kids ask the hard questions, are you prepared to respond? Learn how to craft faithful conversations and be better prepared to tackle the tough stuff with your kids. More than 30 essays from a diverse group of young Christian parents, pastors, and experts address today’s toughest topics, including bodies, gender, race, bullying, suicide, mental illness, death, divorce, money, generosity, technology, faith, and more. When Kids Ask Hard Questions models faithful responses to the big questions and invites you to take a deep breath, create safe spaces for the important conversations, and speak the truth in love. A new and expanded version of Seamless Faith, now with more than a dozen new spiritual practices, space to personalize it with your own favorite practices and scriptures, and additional resources for parents, kids, grandparents, and communities that care about families! Add family faith moments to your daily routine with little or no prep, and share meaningful spiritual experiences with your children! Traci Smith, a pastor and mother of three, offers ways to discover and develop new spiritual practices as a family, whether you’re a new seeker or a lifelong follower. 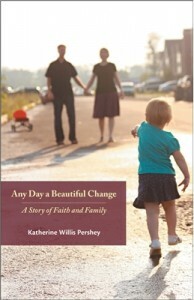 Faithful Families is brimming with more than 50 easy, do-it-yourself ideas for transforming your family’s everyday moments into sacred moments! Read about Katherine in the recent Christian Century feature entitled Bearing Testimony. In October 2011, our first book with Chalice Press was released. Bless Her Heart: Life as a Young Clergy Woman by Ashley-Anne Masters and Stacy Smith was inspired by the stories shared in Fidelia published since 2007. Comprising essays from young women clergy, this book is a reflection on the everyday realities of pastoral ministry for the young, female professional. Presenting real-life, first-person scenarios from young, female pastors in a variety of denominations, church sizes and ministries, this book is intended for young women in ministry, as well as those considering a ministerial calling. Read the review in Fidelia here. When do you learn that “normal” doesn’t include lots of yelling, lots of sleeping, lots of beating? In Blessed Are the Crazy: Breaking the Silence about Mental Illness, Family, and Church, Sarah Griffith Lund looks back at her father’s battle with bipolar disorder, and the helpless sense of déjà vu as her brother and cousin endure mental illness, as well. With a small group study guide and “Ten Steps for Developing a Mental Health Ministry in Your Congregation,” Blessed Are the Crazy is more than memoir—it’s a resource for churches and other faith-based groups to provide healing and comfort. Drawing on memories of making paper cranes with her mother at the kitchen table, Mihee Kim-Kort begins with one of her favorite stories from childhood about the tradition of making a thousand cranes. Intrigued by the symbol of the crane, she explores the migrations and movements of the community of Asian American women. What results is a theological endeavor that engages the social histories, literary texts, and narratives of Asian American women as well as the constructive theologies of feminist and liberation theologians. But, it is ultimately one young woman’s embrace of living into this community and identity, and articulating a particular theology that is hopefully accessible to all who have experienced powerlessness and marginalization. Simply put, Making Paper Cranes is about Asian American mothers, daughters, sisters, and women who courageously discover the grace in the struggle, the survival, and the song. “Remember the Sabbath day to keep it holy.” Yeah, right. Sabbath-keeping seems quaint in our 24/7, twenty-first century world. Life often feels impossibly full, what with work, to-do lists, kid activities, chores, and errands. And laundry… always and forever laundry. But the Sabbath isn’t just one of the ten commandments; it is a delight that can transform the other six days of the week. Join one family’s quest to take Sabbath to heart and change their frenetic way of living by keeping a Sabbath day each week for one year. With lively and compelling prose, MaryAnn McKibben Dana documents their experiment with holy time as a guide for families of all shapes and sizes. Tips are included in each chapter to help make your own Sabbath experiment successful.